We have lost a treasured member of TheTravelzine and a dear personal friend. 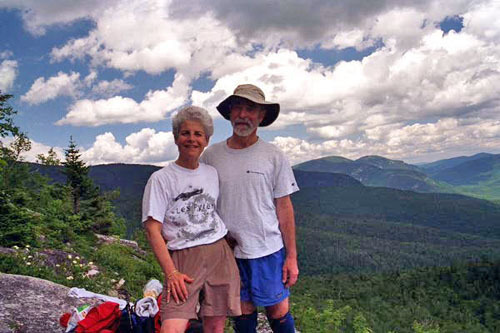 Susie in Newton, who loved Greek Islands, Paris, hiking and mostly mountains, lost her battle with cancer despite fighting back with every bit of strength and determination she could muster. We know you join us in praying that Susie will rest in peace. Susie was a wonderful person, an avid traveler who was quick to offer her help and advice to others. When I was planning my trip to Greece, Susie invited me to her home and gave me invaluable help, lovingly describing her favorite islands and helping me make the right decisions. Susie was a generous, vibrant, delightful woman, and her passing is a terrible loss. Susie would encourage us all to keep seeing, hearing, and enjoying this beautiful world! I wish to join other Ziners and friends in remembering Susie. I met with Susie and Fred in Buenos Aires and from the outset it was as if we were old friends. As many other Ziners I was fortunate to receive not once but many times valuable information given with care and unparalleled enthusiasm. We were also with Graziella and Susie and Fred at the GTG in Buenos Aires and enjoyed their company a great deal. We have very much enjoyed and benefitted from Susie's Zine contributions over the years. We want to extend our deepest sympathy to Fred. I'm so sorry to hear about Susie's illness and passing. She and I shared a love of hiking and travel and often corresponded about Patagonia while she was planning her trip a couple years ago and about the Pyrenees when I was planning my trip. We shared hotel, restaurants, itinerary suggestions and especially our favorite trails in various destinations. I'm so glad she made it to Patagonia before she became ill.
We hadn't corresponded in a while - I was just thinking about her the other day - we just returned from a trip to Bariloche and the Atacama Desert and I was planning to send her feedback and pictures. Sending my best wishes to her family and friends in this difficult time. I just read about the very sad news of our friend Susie. Last year she wrote to me as soon as she knew that I was going to be in Boston. She insisted that I stay with her and Fred in Newton. So we had it all planned. A couple months later she found out that she had cancer. Her mail telling me about it was a lesson on life - on love of life and friends. She wouldn´t even consider of my not staying with them. So I did. She was undergoing all kinds of treatments that left her weak in body but she continued to keep up her wonderful positive attitude. We must always remember her for her marvelous outlook on life, for her courage, her enthusiam and joy for travelling, for how she valued friendship. I know I shall never forget her. To Fred and her sons my sincerest sympathies. I too was saddened upon learning the news about Susie. I met her at the first GTG I attended. We discovered we lived very close to each other and later on got together for lunch. She was a lovely person and was so helpful to so many people on TheTravelzine. I always valued and learned from her posts, as did so many others. I am so very sorry about Susie´s news ... We shared a common love of mountains, music and Greece, and she has been extremely kind along the years. We didn´t have the luck to meet (we talked about it, meeting some place in the Pyrenees or Picos de Europa), but she was extremely near to me. Just yesterday, driving down the Gave d´Aspe towards Pau, I was talking with my mum about some cheese place recommended by Susie, and she asked me if I knew anything about her. Please, send my regrets to her husband. Reading the various messages re: Susie shows the importance of this group. Many of us never met her but knew her through her many messages to the Zine. This group in a way has become an extended or virtual family of sorts, of people with a common love of traveling and meeting and getting to know new people. I've been a member here for many years. I too was very sad to hear about the passing of Susie. I enjoyed reading all her great help and information. I send my regards to all her family and friends. Susie and I shared a love of Paris, and I always enjoyed talking to her about our trips. She was so generous with her travel advice, but it was more than that. She talked about Paris with such enthusiasm that you could see it through her eyes. I remember she said we should be sure to stop at one of her favorite cafes to rest our "tootsies", and we did :-) I can't help but think about Susie whenever I think about Paris. She will truly be missed. I came to know her through her postings here -- her joy at finding just the right chocolate at a tiny bakery in the Pyrenees, her love for the mountains, and her passion for photography. We met several times in Boston during my business trips, and I had the honor of having dinner with her and Fred at their home in Newton. It was a privilege to have known her, and to have shared her travels through TheTravelzine. I did not know Susie personally, but lived vicariously enjoying her posts and enthusiasm. We all will certainly miss her and our deepest sympathies to her family. Although we did not know Susie personally (our loss), her postings helped us in planning several trips. Her enthusiasm for France and all travels was contagious, and Ivan and I will certainly miss her. Our sympathies go out to Fred and her family.